Am I interpreting it incorrectly Ants? Ok, I think I might be wrong. The change is it looks like a player is eligible for this silly draft if they’ve previously nominated for the draft, but they don’t have to have nominated for the most recent draft. I didn’t realise the rules would be that stupid. My shame for underestimating the AFL’s idiocy. so can we get cyril via this rule? This is up there with the most ridiculous of ridiculous rules. Has Marlion previously nominated for the draft? How about Luke Foley? As others have mentioned only happening due to Mummy situation. Despite his limitations very good value for our last rookie spot. And we definitely need a ruck. Well done Adrian. Personally preferred Clarke to Campbell. So does this mean it’s done and dusted and he’s definitely joining us? 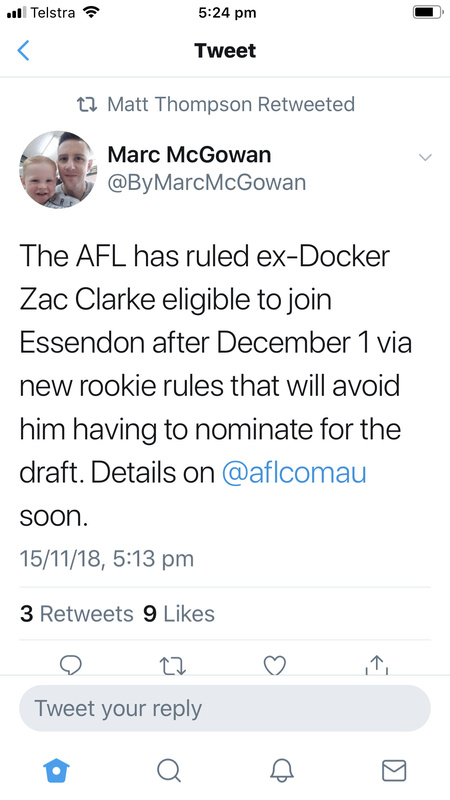 Mumford and Clarke are not nominating for the upcoming draft. Instead, GWS and Essendon will leave one rookie spot open and sign them as rookies on December 1. I’m assuming neither of the guys can train for the club until the. I’ll be interested to see what the wording of that ruling is, because if it’s what those articles indicate, there’s no way in hell a player like Tim Kelly ever goes to the draft again. He’s nominated for the draft before, west coast say they’re interested so he doesn’t nominate this year, Mitchell retires, he goes straight onto their list. Can’t see that causing any issues. Kudos to them for one thing. Made a big song and dance of awarding C*nton and GC the ability to do this - then gave everyone else the exact same thing. And of course, that never happens, does it? Looks like a chaotic evil half-orc fighter. Could use one of those in our party. Hopefully he never plays a senior game - and I mean that in the nicest possible way. He reminds me a little bit of Dylan Clarke and Zac Merrett. I’m disappointed because I reckon Dodoro could have found us someone better somewhere, with his hit-rate on talls. I understand that we need instant backup, but I worry about his competitive-ness in the case that we do require him.